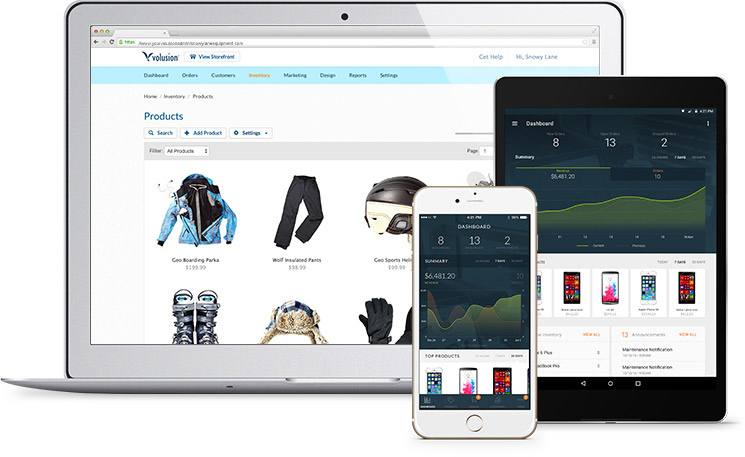 Volusion is one the largest eCommerce shopping cart platforms on the market today. Founded by Kevin Sproles in his bedroom, Volusion has now grown to around 500 employees, serving over 40k stores. They serve everyone from eCommerce neophytes to big names such as intel, 3M, National Geographic, and the Chicago Tribune. With over $90 Million in total funding, they are definitely continuing to expand. Based out of Austin, Texas and operating since 1999, Volusion is a fully cloud-based eCommerce shopping cart. It is one of the most popular all-in-one solutions out there, with features including; building a website, web hosting, the ability to add products and manage inventory, checkout, payment processing, order management, customer management, newsletters, and much more. It has seen a lot of changes in its 16+ years of operation, which have kept it consistently near the top of a rapidly changing market. Our ecommerce software simplifies inventory management with product uploads and tracking. Showcase your products with unlimited display options. When the orders pour in, process orders in bulk, collect secure payments, and ship with your preferred carriers. Ensure your store is listed at the top of search engine results with our robust, user-friendly SEO features. From meta tags to semantic markups, our ecommerce software is designed with SEO in mind. Extend the reach of your store by selling on popular shopping destinations. Your Volusion store seamlessly integrates with Ebay, Amazon, and Facebook, so you can reach millions of new shoppers. Start selling quickly with our ecommerce software including website, shopping cart and secure hosting. Volusion merchants have generated over $18 billion in sales, that’s 4x more sales than our competitors’ merchants. You can rely on us for 24x7 support, dedicated account managers and expert resources; all based out of Austin, TX.